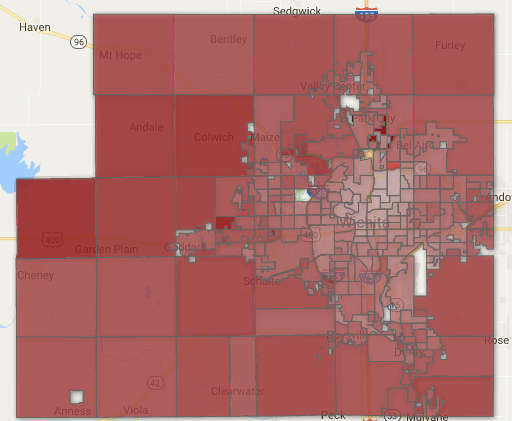 An interactive map of voting in the special congressional election in Kansas district 4, for Sedgwick County only. Intensity of red indicates higher percentage of votes for Ron Estes. By using the interactive map (link below) you may zoom and pan. Click on a precinct to see details of its vote. Precinct sizes — in terms of the number of voters — vary widely. Precincts cast anywhere from one to 950 votes. This is data for Sedgwick County only. (It’s the only data I have at the moment.) Sedgwick County cast 67.9 percent of the votes in the district. Click here to access the interactive map. Built with Google Fusion tables.